Manasota ASALH members bring flowers to Mrs. Jeanne Wilson, our Treasurer Emeritus in gratitude for years of dedicated service to our Branch. Pictured: Mrs. Wilson with President James Stewart. Also pictured, Mrs. Wilson with ASALH members Lois Risacher, Ellen Heath, Kae Watkins, Henry Blyden, and Lonnetta Gaines. Pictured: Manasota ASALH President (and former ASALH National President) Dr.	James B. Stewart with Dr. J.E. Franklin at ASALH’s National Conference on	the occasion of Dr. Franklin’s retirement after 18 years as editor of “The	Journal of African American History,” Friday, October 5, 2018. Also	pictured: President James B. Stewart delivering Manasota ASALH’s annual	report at ASALH’s National Conference, Saturday, October 6, 2018. Pictured: Dr. Rachel Shelley, Keynote Speaker at May 25, 2018 Manasota ASALH Scholarship Presentation at the Family Heritage House Museum. Dr. Shelley, who is the Principal at Booker High School, was named Florida’s 2017 Principal of the Year. Also pictured: Mrs. Fredi Brown with Manasota ASALH President Dr. James Stewart. Mrs. Brown, a Charter Member of Manasota ASALH, co-founded the Family Heritage House Museum in 1990 with her late husband, Ernest Brown. Dennis Archer Event at New College of Florida, March 27, 2018 – Manasota	ASALH sponsored a Book Signing for former long-time Detroit Mayor, The	Honorable Dennis W. Archer in honor of his book, “Let the Future Begin.”	Pictured: Event Chair, Mrs. Lois Watson with Atty. Archer. Also pictured,	then Mayor of Sarasota, Atty. Shellie Freeland Eddie, presents Mayor Archer	with the Key to the City of Sarasota. On February 27, 2016, Manasota ASALH celebrated the 20th Anniversary of the Branch with a sold-out luncheon at the Sarasota Hyatt which featured a stirringly inspirational keynote presentation by ASALH’s National President, Evelyn Higginbotham. Luncheon guests included Ambassador Andrew Young and Dr. Montgomery Rice, the first female President of Morehouse School of Medicine. Funds raised by the luncheon helped to support Manasota ASALH’s scholarship program. 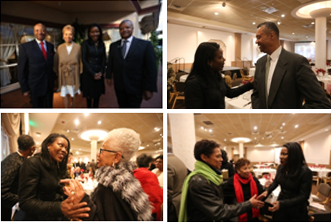 In February of 2015, Manasota ASALH sponsored a fundraising dinner featuring Pulitzer Prize-winning author, Isabel Wilkerson, who spoke about her landmark book, The Warmth of Other Suns: The Epic Story of America’s Great Migration. This highly successful event attracted over 400 attendees who were enraptured by the historical power of Ms. Wilkerson’s presentation. Ms. Wilkerson is pictured below (right) with Event Chairperson, Mrs. Lois Watson. Manasota ASALH partnered with the Senior Friendship Center of Sarasota County to sponsor Veterans Day activities at the Robert L. Taylor Community Complex in North Sarasota. The Traveling “Red Tails” trailer with displays and capacity to seat 40 people to view movie footage about the Tuskegee Airmen. 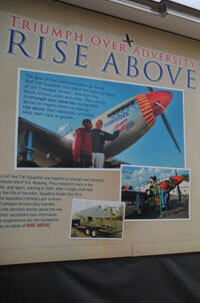 Sarasota was home to several Tuskegee Airmen. A display from the Richmond Civil War Museum in Richmond, VA, called “Take Our Stand,” which details the African American Military experience during the “Jim Crow” period. 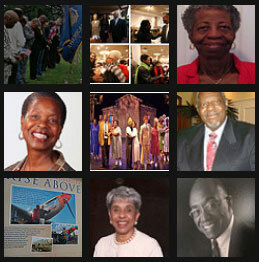 The “Veterans of Color” Documentary Film. 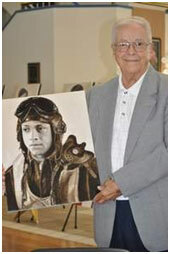 Retired Lt. Col. Hardy (image left) also spoke at the Senior Friendship Center in 2014, sharing his personal history as a Tuskegee Airman in the context of the social history of the United States. Earlier in the branch’s history, retired Lt. Col. George Hardy was honored at a Manasota ASALH luncheon along with his fellow Tuskegee Airmen, Dr. Marion West and Dr. Yenwith Whitney. 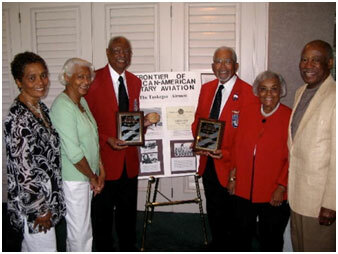 At that time, our Manasota ASALH Branch had three members who had served as Tuskegee Airmen – a most noteworthy fact! Pictured at that luncheon (image right, left to right) are Mrs. Lois Watson, Mrs. Gwendolyn West, Dr. West, Dr. Whitney, Mrs. Lorenza Whitney, and Dr. Bernard Watson. After experiencing a double hit the latter part of the last decade (earthquake followed by a devastating hurricane), members of our branch came to the Executive Board with an idea to assist the country. Through a fundraising event, the organization was able to raise $10,000 to have a fresh water system installed in a village.